This report provides descriptions of and performance data for seven demonstration projects in Europe, North America and the Pacific Rim. It also describes two software tools, UTCFLOW and SIMIAIRT, which engineers can use to aid in the design of such systems. The intended audience includes designers and prospective purchasers and operators of solar air-heating systems using perforated absorbers. 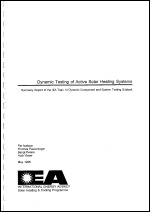 Volume A describes the combined dynamic testing of components and system simulation for small solar heating systems as well as in situ measurements of large solar heating systems. Volume B presents the work on dynamic testing of solar DHW systems. Both volumes contain summaries of the work carried out followed by a collection of papers contributed by Task experts describing the experiences with dynamic testing and measuring in more detail. Task 14 was initiated to advance the state-of-the-art in active solar energy systems. Many features developed during the few years before the start of the Task, when used alone or in combination, had the potential to significantly improve the performance of these systems. It was the objective of Task 14 to analyze, design, evaluate and, in some cases, construct and monitor a number of different systems incorporating one or more of these features. This report summarizes the work of the Dynmaic Component and System Testing (DCST) Subtask with Task 14 of the IEA Solar Heating and Cooling Programme. The DCST Subtask was incorporated in Task 14 on Advanced Solar Energy Systems in 1993 after completion of the Dynamic Systems Testing Group (DSTG), a remote working group within Task 14. The DSTG work was continued and extended in the DCST Subtask. Task 14 was initiated to advance the state-of-the-art in active solar energy systems. Many features developed during the few years before the start of the Task, when used alone or in combination, had the potential to significantly improve the performance of these systems. It was the objective of Task 14 to analyze, design, evaluate and, in some cases, construct and monitor a number of different systems incorporating one or more of these features. The large systems working group within the Task examined large scale heating systems involving temperatures under 200°C. Five large systems were studied. This report covers three of those systems. Two other projects, Solar desalination in Spain, and an Industrial process heat project in Switzerland, are reported separately. 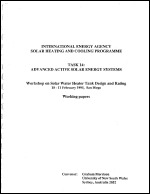 This report contains the working papers from a workshop on solar domestic hot water system tank design and rating. The workshop was organised as part of the IEA SHC Programme and was held in February 1995 in conjunction with the Task 14 meeting in San Diego, USA. The participants included representatives to the Task 15 program from nine countries and industry representatives from six countries. 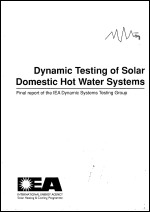 This publciation presents the experiences of the IEA's Dynamic Systems Testing Group (IEA DSTG) on the characterization of the thermal performance of solar domestic hot water (SDHW) systems using the dynamic test method. The complete results of the DSTG's activities are presented in two Volumes of this final report. This volume B "Participant Contributions" contains a collection of papers fo the DSTG participants and other interested researches, describing the findingswith respect to dynamic testing of SDHW systems in more detail.